Just five Lamborghini 5-95 Zagatos will be built. "That's what makes them collectible," Andrea Zagato says. "Bold design is a celebration. It is typical of the mood just before a revolution — when you don't know what's going to happen, you celebrate." MONTEREY, California -- For nearly a century, adding the name Zagato to the end of a BMW, Alfa Romeo, Aston Martin or Maserati model has signified racy styling -- usually characterized by a curvaceous roofline. Italian airplane designer Ugo Zagato opened the coachbuilder in Milan in 1919. While turning out countless special Zagato editions over the years, the Zagato company has had a major influence on the styling of European luxury cars, racers and airplanes. Ugo's son Elio took over the company in the 1950s and raised it to new heights. 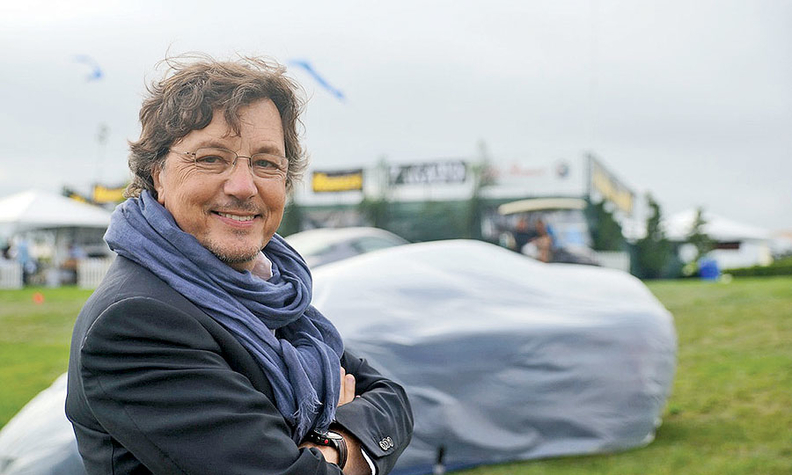 Elio's son Andrea, 54, the current CEO, oversees a brand synonymous with lightweighting, aerodynamics and advanced materials. The third-generation Zagato is repositioning the company as a creator of limited-edition cars. Zagato spoke with Staff Reporter Lindsay Chappell last month as he prepared to unveil the Lamborghini 5-95 to spectators in Monterey, California. Q: Where would you like to take Zagato in the future? A: My mission was to get our company through the economic crisis and position it to survive for a millennium. We had to face the fact that we were not going to be an assembly line company. We're now in quite good shape, and our opportunity is to focus on creating more contemporary collectible cars. Collectible cars are mostly historic -- at least 20 or 30 years old. But contemporary collectibles are modern cars that become collectible in just a few years. Maybe just two or three years old. Most cars lose their value in time. To be collectible, the next owner should be willing to pay more than you paid. If so, it's collectible. It either has to begin with a racing pedigree or a design pedigree. And the car creator has to have a reliable consistency in the sort of cars they create. Zagato is known for expressive designs, but the industry is chasing more down-to-earth goals right now, such as fuel economy and autonomous driving. How will Zagato thrive in this new era? We have been affected by the technology race, but we have also benefited from it. Auto assembly became very efficient and flexible in the 1990s, thanks to the advent of Japanese lean manufacturing. So we really had to abandon the manufacturing line. But at the same time, we saw the arrival of [computer-aided design and computer-aided manufacturing], which is allowing us to create new cars with less investment. And now, 3-D stamping presents us the opportunity to create one-off bodies less expensively. Will Zagato's name ever appear on any small B-segment or A-segment cars? Automakers think in 50,000-vehicle and 100,000-vehicle production increments. Just five of your Lamborghini 5-95 Zagatos will be built. That's what makes them collectible. Some people find the 5-95 design polarizing. That was done on purpose? We call the design neoclassic. Bold design is a celebration. It is typical of the mood just before a revolution -- when you don't know what's going to happen, you celebrate. We don't know what's going to happen in the future. Will we move to electric cars? Hybrid cars? We don't know. So we celebrate the spirit of the classic lines of the 1950s and 1960s. You're not merely buying the car -- you're buying the spirit of the times that we evoke.